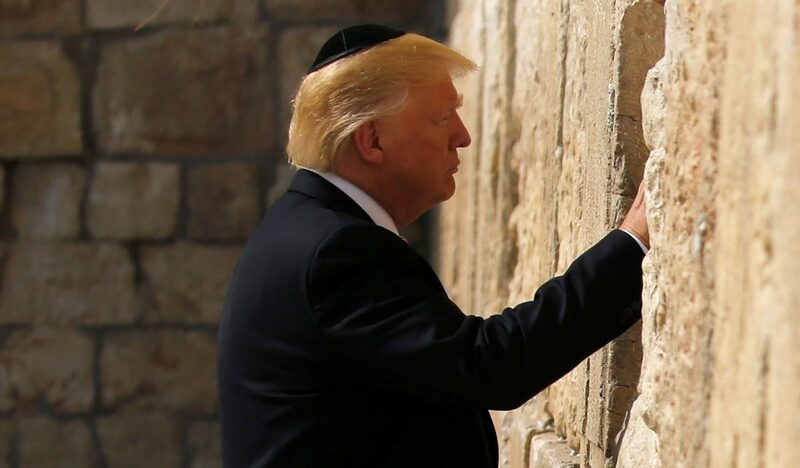 JERUSALEM (CNS) — Following his official welcome to Jerusalem by Israeli President Reuven Rivlin, U.S. President Donald Trump began his two-day visit to Israel and the Palestinian territories with a private visit to the Church of the Holy Sepulcher and Western Wall. Details of the visits to the holy sites had been a carefully guarded secret until the last moment, but from early May 22 the alleyways of the Old City were closed to both residents and tourists, and the main thoroughfares leading to the Old City were closed off to all traffic. Under tight security and led by the traditional kawas honor guard announcing the way with the thumping of their ornamental staffs, the president made his way by foot through the Old City’s alleyways to the Church of the Holy Sepulcher. He and first lady Melania Trump were welcomed at the entrance of the church courtyard by Greek Orthodox Patriarch Archbishop Theophilos III; Franciscan Father Francesco Patton, custos of the Holy Land; and Armenian Patriarch Nourhan Manougian. The president spoke briefly to the religious leaders and stopped at the entrance of the church for a group photograph after also speaking to a few other religious. Meanwhile, Palestinians said Israel had not allowed a Greek Orthodox Scout marching band to accompany the delegation to Church of the Holy Sepulcher as planned because of the Palestinian flags on their uniform. A spokesman from the Israeli Ministry of Foreign Affairs denied any Israeli involvement in the matter, suggesting that it might have been a U.S. security issue. In a visit that encompasses both political and religious symbolism, Trump spent two days in Riyadh, Saudi Arabia, with King Salman and other Muslim leaders. He was scheduled to meet with Palestinian President Mahmoud Abbas May 23 in Bethlehem, West Bank, and was expected to urge the Palestinian leader to take productive steps toward peace.